On our way to Coal Mountain Resort in Argao, Cebu, we missed a turn and ended up taking a much longer route. What should have been an hour’s drive through scenic (though narrow) mountain roads took the better of two hours. You realize later that what you first see when you arrive is only a small part of the whole Coal Mountain Resort. 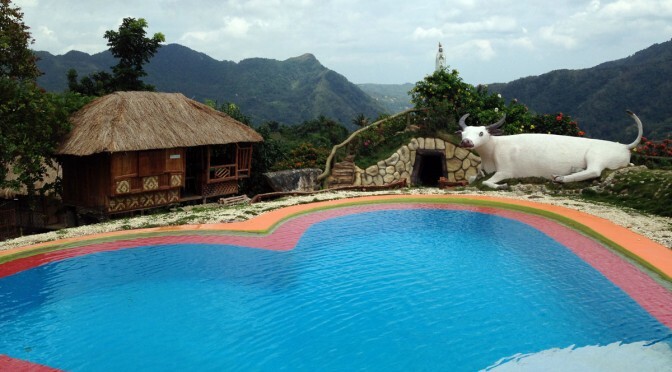 Coal Mountain Resort in Argao offers a wide view of the surrounding mountains. All three of the resort’s pools get water from a mountain spring. Some of it is on an adjacent mountain side, accessible by a wooden walkway built along the treetops. Don’t worry, you won’t fall down. Although the canopy bridge sways with the wind, the side railing of the whole span is made of sturdy nets. A hanging bridge built along the tree tops leads to Coal Mountain Resort’s 16-foot diving pool called Kawasan. Over at this side is a 16-foot deep diving pool fed by water from a freshwater spring. It’s a big private rectangular pool surrounded by trees and with a view of the Argao mountains. If you want to reach this pool much faster, go through the zipline or by cable car. Both activities are being offered at Coal Mountain Resort for a minimal fee of P100 per ride. There’s a portion of Coal Mountain Resort that is underground and visitors can choose to explore it. This dark and damp tunnel is not used for mining but it simulates a mining environment. Vice Mayor Stanley Caminero, whose family owns the mountain retreat, said no other resort provides an experience like Coal Mountain’s underground tour. One of the activities at the resort is an exploration of its demo tunnel. The cavern also serves another purpose: as venue for tunnel rescue training. Caminero said military personnel conduct their safety drills at the Coal Mountain Resort demo tunnel. To explore this underground, you need boots and headlamps and a guide. The resort provides all three. If you want the whole works, including overalls, the charge is P80 per person. In our boots and with lamps and a guide, we are ready to explore the Coal Mountain Resort demo tunnel. I have to admit that as we got to explore the main Coal Mountain Resort area — with its native huts, two pools, and a view of whole mountain sides, it grew on me. I realize that an overnight stay is not enough to enjoy this mountaintop site. It wasn’t small as I first thought it was. Resort amenities are built on a slope so you have to go down stairways to access the dining, kitchen, washing, and even the zipline areas. They’re not immediately visible when you first arrive. A resort guest tries out the 220-meter zipline. There’s a mini zoo on another downhill area with animals like monkeys, birds, monitor lizards (haw or bayawak in Cebuano), and snakes. The altar to the Virgin Mary could have been built on another site, though, and not where it obstructed part of the mountain view from the two pools. By the way, the resort fee for unlimited use of the pools, including the third one some distance away, is P100 for adults and P50 for kids. You can bring food and cook this at the resort. If you don’t plan to bring any, you must inform the staff ahead so they can buy the ingredients for your orders. Remember, Coal Mountain Resort is a long way from supermarkets or convenience stores. Native chicken tinola: the meat was a little hard but it was delicious. In our case, we brought raw meat and fish and did the cooking at the resort. We heard about the native chicken tinola (stew) and ordered some. Our buko juice was from young coconuts freshly picked from the trees. It was truly a feast. There’s no modern stove so we did all the cooking at the dirty kitchen using firewood and coal. The kids, who have only ever seen a gas range or electric stove, chopped the wood, started the fire, and helped with the frying and grilling. It was an experience they’re not likely to forget. If you’re interested in going to Coal Mountain Resort on your own, be forewarned that the way there is confusing. The mountain roads branch left and right and there are no signs to tell you where you are. We had to regularly stop and ask for directions. Even then, we got lost. Plus, I recommend that you use a four-wheel drive. A big part of the route is asphalted or concreted but there are portions that are heavily damaged and have big craters. Argao Vice Mayor Stanley Caminero (right), whose family owns Coal Mountain, regularly stays at the resort. There are existing transport services from Cebu City or from the town center to Coal Mountain Resort. Transport fees depend on the number of people in your party. For more information on accommodations and amenities and corresponding charges, check out this Coal Mountain Resort blog post I wrote before our visit. For everything Argao – from its historic cabecera to its indigenous industries of torta and tableya – check out our mobile guide to Argao or download our mobile web app.